The Fulbright U.S. Student Program, the National Science Foundation, the Rhodes Trust, and other organizations have awarded scholarships and fellowships to 23 members of the College of Arts and Letters’ Class of 2017. Sreeraahul Kancherla, an economics and honors mathematics major from Waxhaw, North Carolina, received a National Science Foundation Graduate Research Fellowship. The fellowship will provide Kancherla, a Kellogg International Scholar and Sorin Scholar, with funding for research-based study to pursue a doctoral degree in economics at the University of California, Berkeley. Grace Watkins, from Blacksburg, Virginia, was awarded a Rhodes Scholarship. Watkins is a philosophy major with a minor in philosophy, politics and economics and a Sorin Scholar and Kellogg International Scholar. Watkins and Caleb “C.J.” Pine, an Arabic and peace studies student in the Glynn Family Honors Program and a Hesburgh-Yusko scholar from Westminster, Colorado, both received a Truman Scholarship, which includes $30,000 in graduate study funds, priority admission, and supplemental financial aid at select institutions, leadership training, career and graduate school counseling, and internship opportunities within the federal government. Lauren Feist, a political science and international economics major and Kellogg International Scholar from Rapid City, South Dakota; Theresa Rinaldo, an Arabic and peace studies student from Orchard Park, New York; and Sienna Wdowik, an Arabic and political science major, Hesburgh-Yusko and Kellogg International Scholar and member of the Glynn Family Honors Program from Fort Collins, Colorado, each received a federal Boren Scholarship to study abroad. Two Arts and Letters students received Benjamin A. Gilman International Scholarships to study abroad. Moira Horn, a gender studies and Arts and Letters Pre-Health student from Lakewood, Ohio, studied in Puebla, Mexico, in fall 2015. Areli Rodriguez, a history and IT management student from Hammond, Indiana, studied in China in summer 2015. A marketing and journalism, ethics, and democracy student from Madison, Wisconsin, Cassidy McDonald was awarded a Luce Scholarship, which supports a one-year professional placement and cultural immersion experience in Asia. Three seniors received U.S.-U.K. Fulbright Commission Summer Institute scholarships: Henry Dickman, economics and accountancy, Richmond, Indiana; Benjamin Fouch, political science and finance and a Kellogg International Scholar, Brownsburg, Indiana; and Jacqueline Wilson, political science and IT management, Grand Rapids, Michigan. 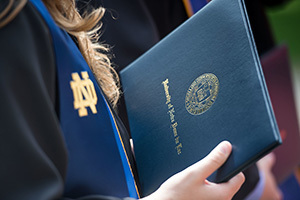 Dickman, Fouch and Wilson are all Hesburgh-Yusko scholars. Sara Abdel-Rahim, a political science major from Valrico, Florida, was awarded a study and research grant to Greece. Haley Adams, an anthropology and biological sciences major from Midland, Michigan, received an English teaching assistantship to Poland. Connor Bliss, a history and physics major from Glenn Dale, Maryland, will travel to Spain for an English teaching assistantship. Luke Donahue, a native of Brentwood, Tennessee, with majors in theology and German received a study and research grant to Germany. Dana Drysdale, an English major from Florissant, Missouri, was awarded an English teaching assistantship to South Korea. John Gadient, an international economics major from Perrysburg, Ohio, received an English teaching assistantship to Germany. Maya Jain, a theology major and native of Dearborn, Michigan, will travel to Peru for an English teaching assistantship. Joseph Rebagliati, an international economics major from Bellevue, Washington, was awarded an English teaching assistantship to Spain. Peter Stankiewicz, a Deptford, New Jersey, native with majors in Russian and biochemistry will complete an English teaching assistantship in Russia. Dolores Vargas, a psychology and German major from Hayward, California, was awarded an English teaching assistantship to Germany.